Friedberg Unlisted (W-Unlisted). No Act Date, Presumably Act of December 23, 1857. $100, $500 & $1,000 Interest Bearing Notes. PCGS Currency New 62. Face and Back Composite Essays.Hessler-Unlisted. Set of hand constructed essays for the faces and backs of $100, $500 and $1,000 notes in sheet form. Hand drawn with built up elements of India paper and sepia photographic vignettes, mounted on large size Reynolds Bristol Board with impressed crown in circle. The counters are in red and made of India paper engraved and printed. The top two vignettes are sepia elements mounted on the board. 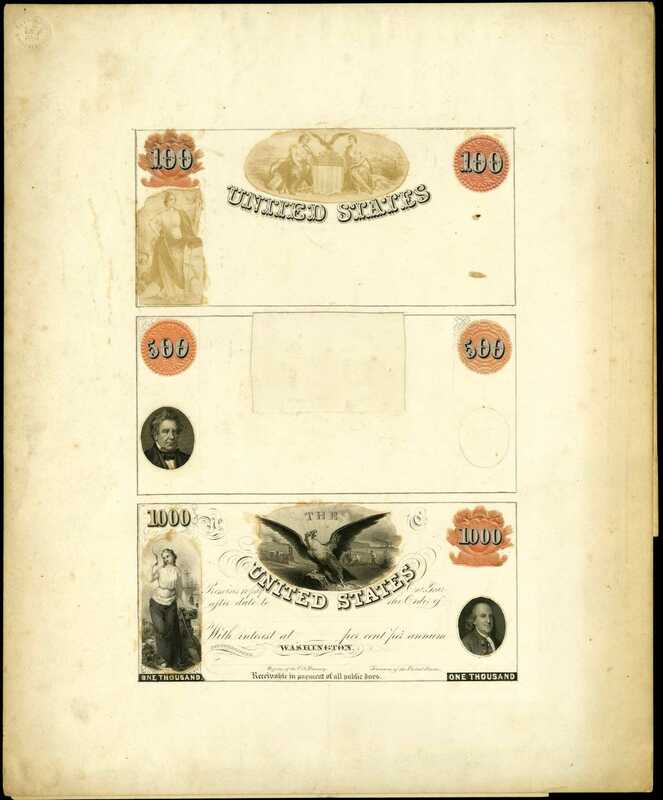 The eagle vignette on the $1,000 is intaglio engraved on India paper and mounted. The portrait vignettes are India paper and mounted to the board. Only the $1,000 note has text drawn in black pen. There is a cutout in the $500 vignette area. The backs are orange composed of intaglio India paper elements mounted to the board. There is a rectangular cut out at the lower left of the back board. Another unique pairing, originally in the Jocelyn group and later in the Ford Collection. From Lyn Knight, 2011; Stacks sale of the John J. Ford Jr. Collection, Part VI, October 12, 2004, lot 492.